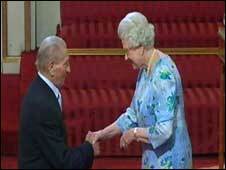 One of the great footballers of his generation and the world's oldest coach has received an MBE from the Queen. Ivor Powell, 91, is still on the staff with the Team Bath side at the city's university after more than 30 years. The Bargoed-born former miner, who is honoured for his services to sport, called the award "an honour and a privilege." He played 14 times for Wales and was a team-mate and close friend of Sir Stanley Matthews at Blackpool. In 2004 he was inducted into the Welsh Sports Hall of Fame. At his playing peak, Ivor set a record transfer fee for a halfback of £17,500 when he moved to Aston Villa in 1948. One of his other many roles was alongside Don Revie when Leeds United were the top club in the country. He said: "I'm 91 and I've still got something left in me to give."